Matured wholly in air-dried, hand-selected ex-bourbon casks, the ‘unashamedly excellent’ Old Pulteney 12-years-old is the definitive expression in the Old Pulteney family. Traditionally crafted using techniques that other distillers have long abandoned, this winner of numerous gold medals at the most prestigious international competitions is a high water-mark of quality spirits. Deep amber with a slight pink hue. Medium to high intensity, dry with a hint of sea air. Dry, medium bodied and smooth with a clean finish: faintly salty with a slight sherry note. The Old Pulteney 12 Years Old along with the Aberlour 10 Years Old were two of my earliest whiskies that really turned me on [to whisky]! Both on a good day can be had for around £20 from most supermarkets under offer [usually around about this festive time of year]. Both also represent some of the best whisky money can buy in this price range in my honest opinion! Whereas the Aberlour is sherried, this Old Pulteney expression is the perfect example of a slightly peated, slightly salty Highland malt that really sets the standard for its region. Tasted as part of the #PulteneyTT online twitter tasting, I have previously had 2 or 3 bottles of Old Pulteney 12 Years Old. They do not last long even within a reasonably sized collection such as we have, and certainly never long enough for me to make tasting notes on before! The Old Pulteney still famously has its top chopped off and the lyne arm sprouts from the side, presumably to fit under the roof, also a large boiling ball shape to aid reflux is apparent! During the tasting I quizzed @OldPulteneyMalt about this unusual setup who stated “nobody really remembers what it was like before. We don’t even know when it happened exactly. 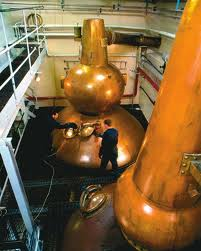 But the unusual shape of the stills has a tremendous impact on OP’s style. The shape and size affects reflux and copper surface contact. Very important. Our Master Blender – Stuart Harvey – says that the wash still with its huge boil ball is at the heart of the #PulteneyTT NMS style… Part of Pulteney’s complexity comes from traditional worm tub condensation which leaves the spirit heavy and flavoursome.” – I suggested they change nothing as the end product is fantastic! Absolutely. Personally I think OP 12YO is fantastic value for money and a very delicious and drinkable dram and I continue to be a huge fan of everything I have tried from Old Pulteney. I may even have to take them up on their commentary “You should move to Wick. Getting stuck in traffic is not really a big problem here” – SIGN ME UP!